Removed from the package, the tabs have an orange-vanilla scent, which sounds appetizing enough. However, thereâ€™s something a little mediciney about it that actually turns my stomach. You know how when you were a kid, the dentist would let you pick your flavor of that fluoride foam? And the flavors all sounded really yummy, like bubblegum and Creamsicle, so you always picked one of those, conveniently forgetting the important kid rule that the tastier the flavor of a medicinal product sounds, the nastier itâ€™s actually going to be? 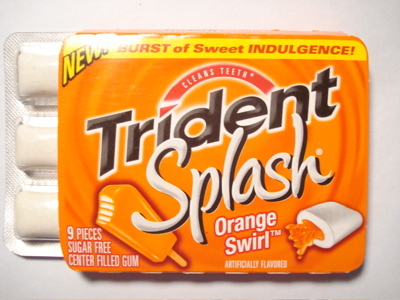 This gum smells exactly like Creamsicle-flavored fluoride treatment foam. And that stuff was pretty darn vile. Fortunately, though, the flavor doesnâ€™t resemble said dental product at all. I was expecting menthol, but itâ€™s actually just a bright orange soda flavor, almost sickly sweet. The crisp candy shell, soft gum, and gooey center make a nice texture contrast, and they donâ€™t skimp on the goo either, but as is usual for this type of gum, I find the pieces too darn small. As you chew, the sweet orange flavor wears off fast, leaving just a mild sweetness â€“ and a strong aftertaste of aspartame. The flavor does last for a pretty long time â€“ but itâ€™s the flavor of artificial sweetener rather than delicious orange. I never thought Iâ€™d hear myself say this, but I think some menthol might actually have helped, since it seems to cover up the flavor of artificial sweeteners better than fruit flavors do. A second piece was admittedly better than the first â€“ the aspartame shock seems to wear off a bit after the first piece. Like other products marketed more as dental aids than candy, the flavor of this gum left a lot to be desired. When the best thing you can say about a product is â€œit tastes better than fluoride treatment foam,â€ thereâ€™s not really very much to recommend. Thanks but no thanks – Iâ€™m sticking with my Hubba Bubba. Nothing beats good ole Orange Bubbalicious.